In paid partnership with Athleta. As you can tell from my recent Insta-Stories, I've been SO obsessed with Autumn in Saint Louis! The trees, the weather, and the overall environment is just so calm and stunning. My favorite place to be active outdoors is Creve Ceour Park in Saint Louis. The pathways are strikingly colorful, and always full of life. I absolutely love taking advantage of a beautiful day outside, and take my basic workout outdoors to get the best of both. Its a really great start to getting you motivated. As I was getting ready to head out for a power walk with my sisters, I put on newly received workout attire from Athleta, and can truly accredit that a little retail inspiration is just the trick to get you moving this November! I decided to step out of the ordinary black tights and try out the Stealth 7/8 Tight in maroon. What I love about it is that it has Skulptec Technology, making your legs and body feel instantly firmer and more put together. I felt so comfortable jogging in these outdoors, and they're so versatile that I wear them now to university with long sweaters and coats! 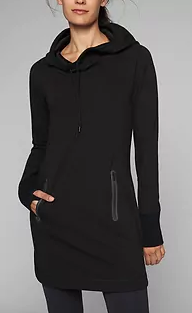 To top off the tights, Athleta was so kind to send the Cozy Karma Dress, considering what was most suitable for my modest workout attire. It's absolutely amazing with the little thumb hole details, to the wide cowl neck hoodie, to the large pockets for keys & a phone, down to the plush interior lining for the crisp November weather. Lastly, I wore the Responsible Down Bomber in silver, adding the perfect polished element to finish off my look. Ultimately, I hope this post has inspired you to change up your wardrobe and take your workout outdoors this November! Whether it be hiking in your local park, or jogging in the neighborhood, don't underestimate the power of a good outfit to get you inspired and moving. 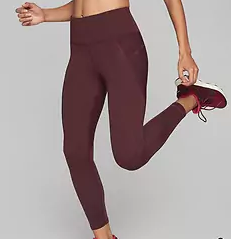 Shop my full look from Athleta below!